On April 2, Cincinnati enjoyed the annual Findlay Market Opening Day parade. As part of that “rite of spring” celebration, Music Hall’s doors were open to anyone who wanted to come in, chat, and take a look around. The foyer was decked out in “Cincinnati red,” including red-gelled lighting on the ceiling. SPMH and Music Hall welcomed dozens of individuals, and SPMH Program Guides gave free tours of the building. One visitor we were especially delighted to see was Mr. Edward Klusman. Mr. Klusman stopped by to see how Music Hall looked following the revitalization. While he was here, he shared with us that he and his wife Pat own one of the hand-carved, cherry-wood panels from the original Hook & Hastings Music Hall organ. This panel, titled “Noon,” is hanging in his home. How did he come by this unique treasure? Mr. Klusman’s father-in-law, Leonard Conrad, worked at Music Hall during the early 1970s renovation – a huge job touching all parts of the structure. Because the manager was ill, Mr. Conrad stepped in as acting manager and supervised the day-to-day work. He was presented the panel as thanks for his part of the renovation work. After Mr. Conrad passed away, the Klusmans discovered the panel among his possessions. Three panels represented morning, noon and evening. 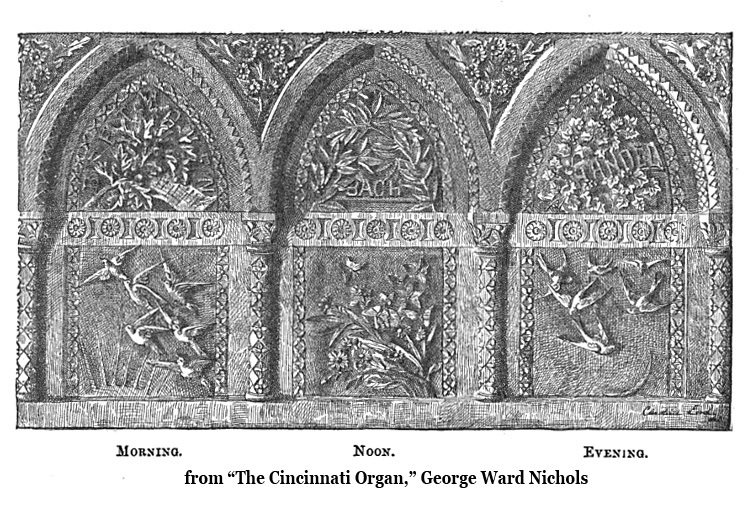 The Noon panel owned by the Klusmans is described in the book “The Cincinnati Organ” by George Ward Nichols. “Noon” is depicted by a field of grasses, with flowers opening wide their fragrant bosoms, with butterflies hovering in the heat, with drone of bee, and insects hum. 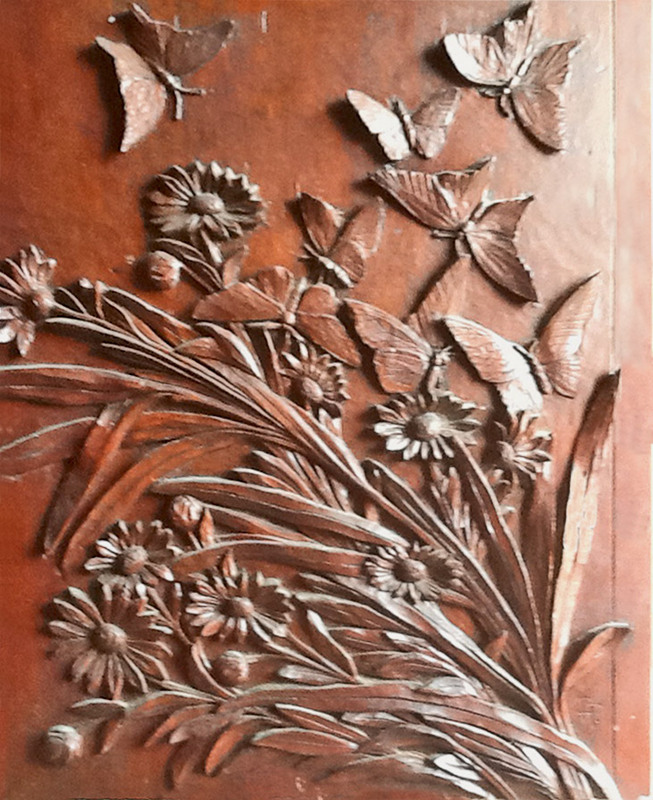 The panel was designed by Laura Fry, the daughter of William Henry Fry, a noted wood carver and teacher. Ms. Fry is considered an important leader of Cincinnati women’s decorative arts movement in the 1870s and 1880s. Around 100 women—all students in two schools of wood carving in Cincinnati—donated their time and talent to carve the panels, frames, freizes, capitals and finials that decorated the screen of the great organ. Mrs. F. H. Force was one of those women. “Noon” is the panel she carved. Reuben Springer was quite impressed with the quality of work and the generous nature of the women to donate their time. As a result, he funded a contest, offering $500 in gold to be distributed among ten women. There were ten premiums: three for first place, two for second, and five third premiums. Three judges were assigned to review the panels, one of whom was Samuel Hannaford, architect of Music Hall. By the late 1960s, Music Hall was dated and had fallen into disrepair. The structure was scheduled to undergo a great deal of work. The great Hook & Hastings organ needed extensive work too. Philanthropist J. Ralph Corbett chaired the Cincinnati Music Hall Association board. He himself had contributed over $6 million dollars to updating Music Hall and he worked to find a funder for the organ. But no one stepped forward to provide the nearly $300,000 to repair it. In the summer of 1971, during construction of a new backstage, shop and scene storage, the organ was dismantled. When the organ was rebuilt in 1923 the work was done by the Austin Company. Old St. Mary’s Church had a late 1920s Austin and volunteers came to Music Hall and salvaged what they could. Mostly it was metal flue work, as wooden pipes were split and had already been repaired. Several other churches reportedly received parts too. ORIGINAL MUSIC HALL ORGAN CONSOLE – And seat. Will make a perfect roll top desk. $150. Many of those beautiful hand-carved panels didn’t fare as well. 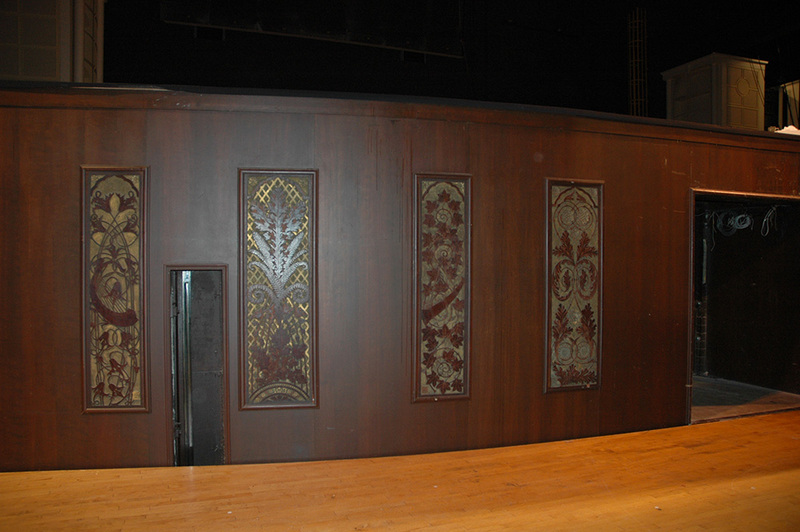 A handful of the original panels were installed in Music Hall’s orchestra pit. As black cloth covered the walls of the pit when the orchestra played during performances, few knew of their existence. Other panels were sold or given away, like the one given to Mr. Klusman’s father-in-law. Several went to the Cincinnati Art Museum and the Cincinnati Historical Society. Two were hung in Music Hall in the north wing. The rest were thrown away. In 2010, Kathy Janson realized the importance of these panels and initiated a campaign to collect and restore as many as possible. Mrs. Janson was a member of the SPMH board; SPMH funded this preservation effort, along with a video titled “The Art Carvers of Cincinnati Music Hall.” The video illustrates the artistic importance of these panels and the restoration process. The renewed panels are now showcased in Music Hall. The organ panels are displayed in the Taft Suite in Music Hall. While the Taft Suite is normally off limits to visitors, SPMH tours take people into the room to see and appreciate these works of art. So check out dates and sign up now for an SPMH Backstage and Beyond Tour of the interior of Music Hall! 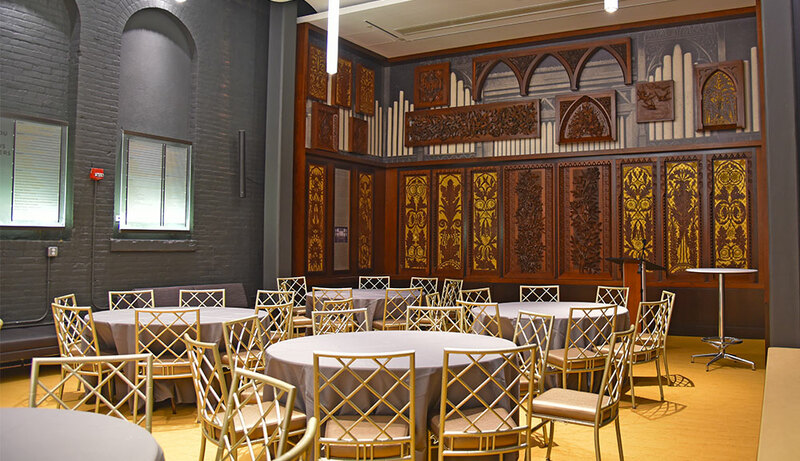 The detail work and artistry of the hand-carved panels can be viewed in the Taft Suite during tours of Music Hall. 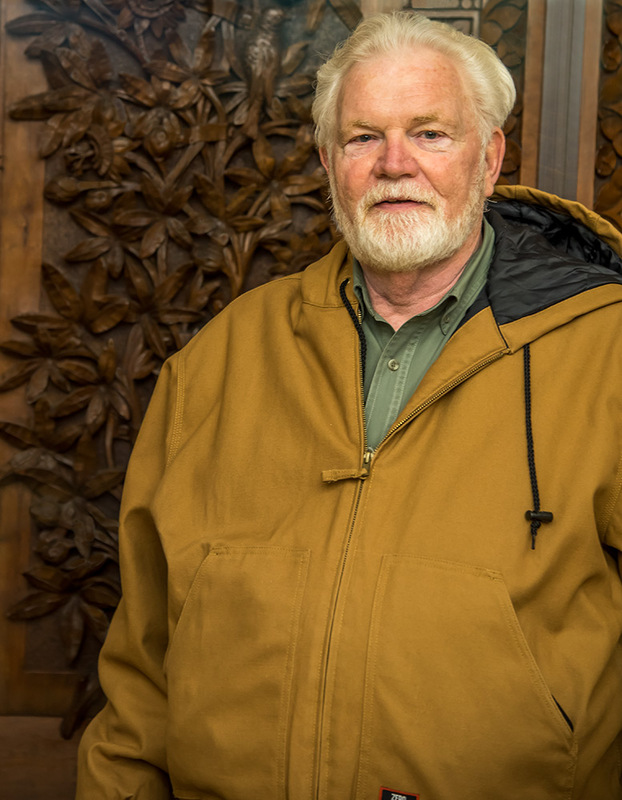 Mr. Klusman, we all appreciate meeting you, seeing your photo of the art-carved panel, and talking with you. Hope you get an opportunity to come back to visit – anytime!